The Mohr method uses chromate ions (CrO42-) as the indicator for the argentometric determination of bromide, chloride and cyanide ions. The first substance to precipitate is the least soluble AgCl then, after the point of equivalence, the first addition to excess leads to the precipitation of Ag2CrO4 which is brick red in colour. Colour of solution at equivalence point with Mohr method titration. Source: Istituto Professionale di Stato "F.S. CABRINI"
As we have seen, one of the main characteristics of an indicator is that it needs to change colour during the steep part of the titration curve (precipitation). The concentration of chromate ions necessary to start the formation of silver chromate under equivalence conditions can be calculated from the solubility product of silver chromate. In effect, a concentration of chromate ions equal to 6.6 x 10-3 makes the solution go such an intense yellow that the colour turning point can no longer be seen. This is why weaker chromate ions solutions are usually used. 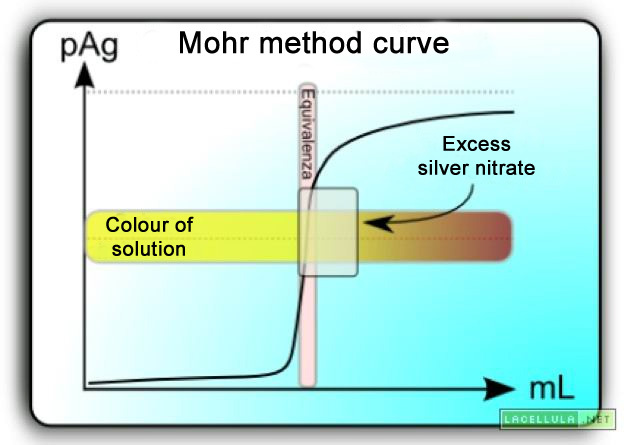 We should remember that the Mohr method can only be used in the pH interval between 6.5 and 9.0; if the pH is lower than 6.5, the CrO42- ions react with the H+ ions to form HCrO4- which slows down the precipitation of silver chromate and leads to error in excess. If the pH is higher than 9.0, the silver ions precipitate as AgOH which is more insoluble than silver chloride, leading once again to error in excess. Silver nitrate solution is not a parent substance, though it can be obtained in its pure state. It actually contains water in its crystals which can be eliminated by heating to 150°. At this temperature, however, contact with the organic substances contained in atmospheric dust leads to reduction to metallic Ag, which makes the surface of the crystals turn black. This is why we can prepare a solution of AgNO3 at a known concentration using the Mohr method. 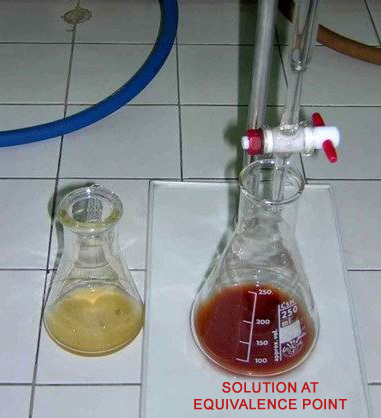 First an approximate AgNO3 solution is prepared and then this solution, which needs to be kept away from light, is standardised using NaCl as the parent substance and a 5% solution of K2CrO4, as the indicator, using about 1 ml for every 50 ml of NaCl solution. Suppose we want to prepare a 0,1 N solution of AgNO3. N = neq/L neq = g/P.E. 17g of AgNO3 should be weighed out and dissolved in 1L of distilled H2O. 580mg of NaCl then need to be weighed out, put in a volumetric flask and then diluted with distilled H2O to 100ml. 15ml of this solution should then be removed and put in an Erlenmeyer flask and 20 drops of K2CrO4 at 5% should then be added as the indicator plus about 50ml of distilled H2O. The solution turns yellow. The AgNO3 is put in a burette and used to titrate the 15ml of NaCl. The stoichiometric point of equivalence is indicated when a persistent brick red precipitate of Ag2CrO4 forms, i.e. it does not disappear when shaken. The Mohr method can also be used to determine the concentration of chlorides in water. Determining the amount of chloride ions present in water destined for human consumption is obviously of fundamental importance especially as these can come from the soil, from industrial and urban waste and from the salt used to melt ice on roads. The presence of chloride ions over and above a certain level of concentration can give water unpleasant organoleptic effects. The presence of chlorides in human drinking water can, in certain cases, be taken as an indicator of anthropic pollution and needs to be compared with other analytical and environmental data. Chlorides are present in all rain water, lakes and underground water sources thanks to the mobility and solubility of these ions. Where underground sources are concerned, the concentration can range from a few mg/L up to 1000mg/L; higher levels are present in water which is in contact with evaporitic rocks (halite). There is no upper limit where mineral water is concerned but values over 200 mg/L give it its salty taste. Suppose we want to determine the concentration of Cl- ions in a particular water and we have a 0.099 N solution of AgNO3 to use. If the volume of water taken initially is 10ml, it has been diluted 10 times and the final volume of titrant is 2.3 ml, what will be the concentration of Cl expressed in grams per litre? Where 58.46 = P.E. of NaCl.